blogs t r e t c h: Be There, eFriends! Come one, come all, to the greatest 1/19/06 blogger happy hour of them all! 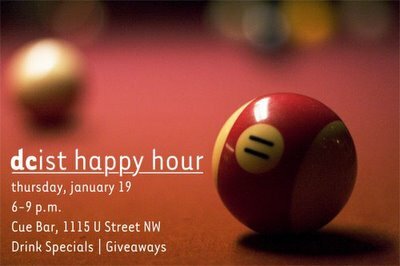 Join my fellow DCists and I as we take over Cue Bar (on U St. btw. 11th & 12th). Drink specials! Bing pong! Pool! Me! DJs! The opportunity to compare people's heights to their headshots! It's truly a not-to-be-missed opportunity. See you there!